The Great Depression and WWII Helped Make Popcorn a Popular Snack in the U.S. Popcorn saw its biggest surges in popularity during times of duress, particularly during the Great Depression and WWII. The former of which because popcorn was an extremely cheap snack, being one of the few snack items many families could afford. So while many in the snack industry struggled through the Great Depression, the popcorn industry thrived. Popcorn saw another huge surge in popularity during WWII, thanks to sugar rations, which made candy much more expensive and hard to come by. During WWII alone, Americans began eating three times more popcorn than they had before the war. 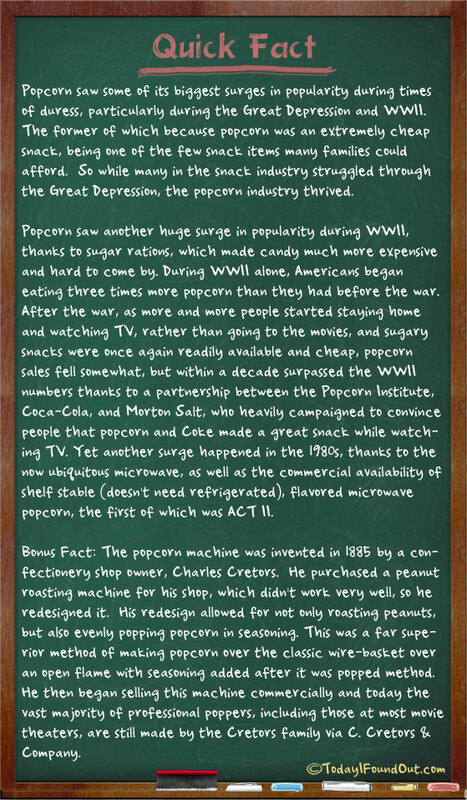 After the war, as more and more people started staying home and watching TV, rather than going to the movies, and sugary snacks were once again readily available and cheap, popcorn sales fell somewhat, but within a decade surpassed the WWII numbers thanks to a partnership between the Popcorn Institute, Coca-Cola, and Morton Salt, who heavily campaigned to convince people that popcorn and Coke made a great snack while watching TV. Yet another surge happened in the 1980s, thanks to the now ubiquitous microwave, as well as the commercial availability of shelf stable (doesn’t need refrigerated), flavored microwave popcorn, the first of which was ACT II. Bonus Fact: The popcorn machine was invented in 1885 by a confectionery shop owner, Charles Cretors. He purchased a peanut roasting machine for his shop, which didn’t work very well, so he redesigned it. His redesign allowed for not only roasting peanuts, but also evenly popping popcorn in seasoning. This was a far superior method of making popcorn over the classic wire-basket over an open flame with seasoning added after it was popped method. He then began selling this machine commercially and today the vast majority of professional poppers, including those at most movie theaters, are still made by the Cretors family via C. Cretors & Company.